Yup, I spent the weekend in the kitchen, probably one of my favorite rooms in the house! You never know what goodies will happen to "fall" into your mouth!! It started out as the perfect weekend, it was snowing...but since Maggie can't romp around in the snow with me it's just not as much fun so I decided to make her some biscuits to lift our spirits up! Santa Paws gave us a box of biscuit mix, just pour it in the bowl, add water and a little bit of oil and let the mixer do the work! Give it a lick to make sure it's tasty! Bake them in the oven and patiently wait for Mom to tell you they're done. Who says you have to wait for them to cool?!?! Maggie is going to LOVE these!!! I think this is just what she needed!! There are often Target Promotional Codes available for all most of these doggy treat cooking supplies. Wow, you look like a Chef !! I'm sure Maggie felt much better after she taste your cookies ! What a thoughtful sister you are!! And an excellent baker, too!! Now we're really interested in that biscuit mix! Tryin' to make out the name on the box. But the box is turned sideways...nuts! Maybe da Momma can actually handle something that's instant and we'd get more treats in our house! Wuv your chef outfit! Such a good dogsis to bake her some biscuits. We could almost smell them here..
Good you checked them each step of the way to make sure they was perfect! !Taste testing is good! You are a great chef! 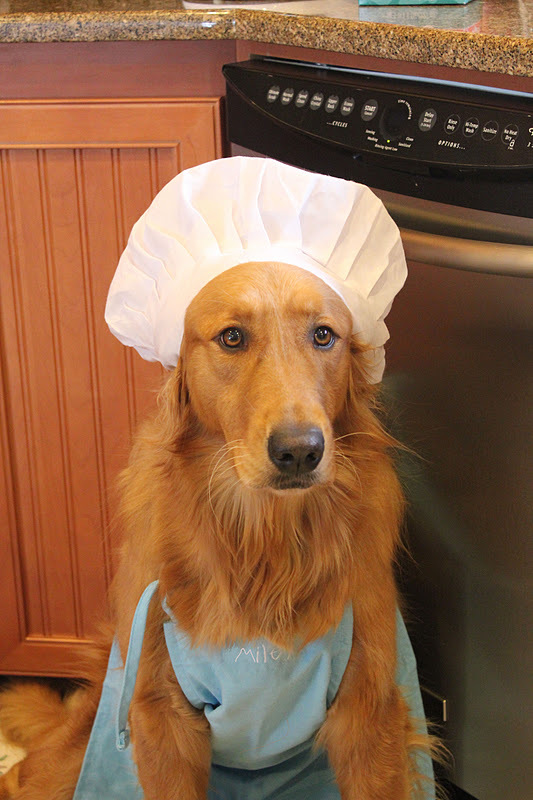 Oh my goodness, you look wonderful in your chef's hat and apron!! I love it! I'm reading this during lunch and I showed your post to a couple of my coworkers--We've decided that you can bake for US anytime!! Your treats looks wonderful!! I hope your week is off to a good start--With those cookies how could it not be?! Miley you are a super cooker chef and superb sister.. all ROLLED OUT into ONE.. hehehe I made a Frankie funny fur you. ROLLED OUT.. get it??? My Mom is baking "home made Milkbones" Right now.. and my house smells grrrreat. YOURS must have smelled FANGtastic. Wish I could smell those goodies they look so yummy. You look sooooo adorable in your chef outfit! I LOVE LOVE LOVE your outfit! I want to cook treats now. How did you not burn your tongue??? That is a pawesome hat and those cookies look very tasty! 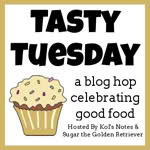 Thanks so much for joining in our Tasty Tuesday blog hop! Wow, you are a great chef!!! Our human sister got a package of that mix for Christmas too, and now you have us wondering if she made them yet, we would like a taste of them too. We are guessing that Maggie was very pleased with your thoughtfulness. Wow Miley - I'm so jelly that you can reach the countertops.....I've tried, no go!! Miley, you are just the best brother ever! Maggie is gonna love these. You are adorable in your chef's outfit. I wish you could come over and bake some of these for my little girls. They would love it.